If you control a "Blackwing" monster other than "Blackwing - Harmattan the Dust", you can Special Summon this card (from your hand). You can only Special Summon "Blackwing - Harmattan the Dust" once per turn this way. 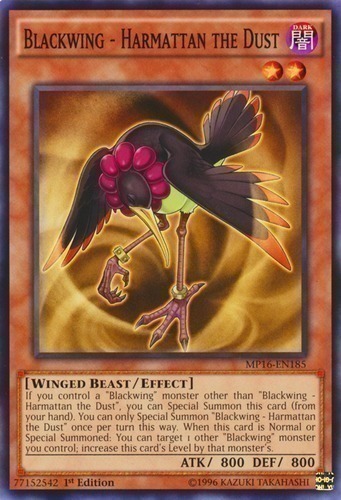 When this card is Normal or Special Summoned: You can target 1 other "Blackwing" monster you control; increase this card's Level by that monster's.